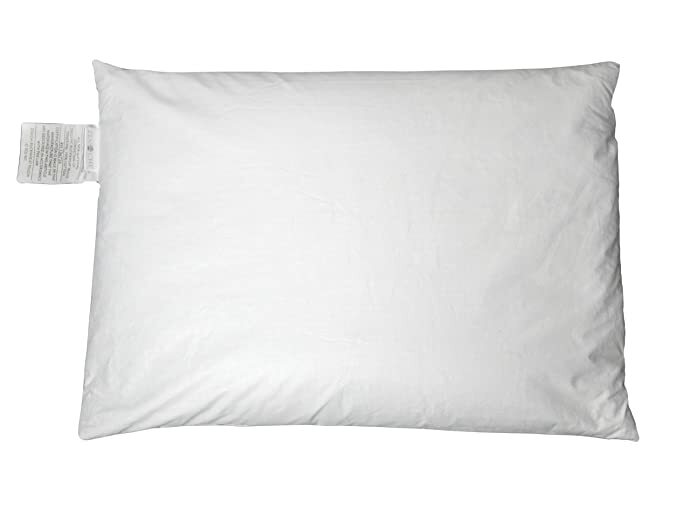 If you are looking for a pillow that is 100% natural, that does not get hot, is firm and supportive enough the buckwheat is what you should buy. 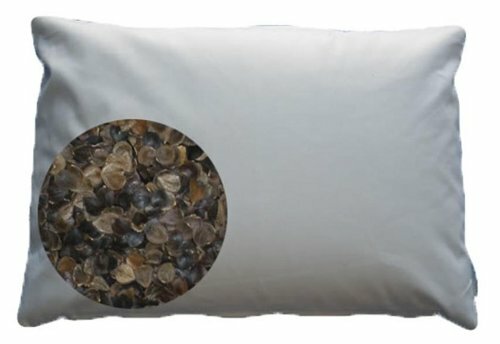 A buckwheat pillow is an organic cotton case with some buckwheat hulls as stuffing. It is a very popular pillow type in Asia where it originates from, but in the past few years, its popularity has been on a steady rise in other parts of the world including in the USA and UK. This fabulous pillow gives you the same feeling that you get with microbead stuffing and you can mold it into the shape that you want. But, with the different types and brands available in the market it is important to know how to choose the best among them. We also have buying guide about Best Memory Foam Pillow if you want to take a look. This Sobakawa buckwheat pillow from Natures Pillows is just what you need to give your head maximum comfort for a good night's sleep. The pillow is from 100% buckwheat hulls, and the fact that it is a product from the USA means that you can be sure about the quality of the fillings. Also, the casing is from comfortable and genuine cotton material that also adds to the quality of the headrest. The amount of filling on the pillow is just right for most people, and this is more so for those that sleep on the side. It is also lightweight to ensure that you can carry it when traveling or use it when driving, for yoga or even support your neck when sitting down. The casing is 100% cotton and made in the USA. Also, the filling is also 100% buckwheat hulls. Sobakawa buckwheat pillow is a therapeutic, comfortable and very supportive pillow. The air circulation is excellent, and so you will not sweat a lot when using it. It is one of the cheapest buckwheat pillows on the market. This buckwheat hull pillow is light which means that it is convenient to carry when traveling. The quality and amount of hulls make it perfect for people that like sleeping on their side. Individuals with asthma and migraines will have a better experience when using it. Some users complain that it is too thin. There are also a few issues about the pillow not having enough hulls. Sobakawa buckwheat pillow from Natures Pillows can be quite noisy as it makes a crunchy sound when you move around. This buckwheat pillow is not as fluffy or soft as regular ones. It will not offer you as much lift as you would want. The Beans72 is a special headrest with the sole purpose of ensuring that you can sleep for long and comfortably. It is of pure USA grown buckwheat that is also organic, and they come in an unbleached cotton casing that adds to the comfort. This organic buckwheat pillow is quite bulky, and this is a good sign because it shows that it has more than enough hulls inside and it is also broad enough to ensure that you have adequate space for your head. The high-quality of the hulls provides maximum air circulation so that you can enjoy your sleep without excessive sweating. Also, the soft cotton casing and the quality shells are also very helpful for individuals who have common sleep problems such as stiff neck, muscle pain, and stress. The odor should also be the least of your concern because the manufacturer assures that the pillow will not develop any for its lifetime unless you pour something on it. And to top up all these useful features it also includes a zipper that makes it possible to increase or reduce the hulls. These impressive features help to make it the best organic buckwheat pillow. The casing is 100% pure cotton and without any bleaching. Beans72 pillow has 100% USA grown and organic buckwheat hulls. These hulls guarantee maximum air circulation to ensure that the pillow remains cold. Beans72 has just the right amount of shells to make sure that it conforms to your head and neck. It can also help with sleeping problems like tension, muscle pain, and stiff neck. This organic buckwheat pillow will not lose its shape as you sleep which means it will remain comfortable all night long. You will never have to agonize about odor for the lifetime of the pillow. The manufacturer uses a unique formula to get rid of all debris and dust from the hulls. It will be too heavy for some individuals. The weight also makes it inconvenient to carry when traveling or for use when driving. There are some sunflower shells in the pillow which most people will not like. It is quite a pricey buckwheat headrest. This organic buckwheat pillow is a little too hard before you get used to it. Natural buckwheat pillows are a great alternative for people with foam allergies. But this one from Zen Chi is as comfortable as any headrest can get. It comes in four distinct sizes including the large king size to ensure that you can always find just the right size for you. Although the hull quantity will vary from one size to the other, you can always be confident of getting at least four pounds of shells regardless of what you choose to buy. Also, the hulls in Zen Chi pillows are 100% organic, and hence they are suitable for use by anyone. The case is also from pure cotton, and it is washable to make maintenance easy for you, and it also has a zipper. This zipper comes in handy when you need to customize the pillow as it makes it possible to add or reduce the hull quantity. Side sleepers will also love this pillow as it will make their nights more comfortable and if you add in the excellent air circulation, you will have the perfect headrest for a good night’s sleep. It will always mold according to the shape and size that you desire. This Zen Chi pillow provides a firm and adequate support for most individuals. It is a perfect product for people that prefer to sleep on the side. You can customize it by adding or removing some hulls. There are no chemical odors in the pillow, but it has a sweet and faint plant smell. Zen Chi Organic buckwheat pillow will remain cold throughout the night thanks to the excellent air circulation. The cotton case is machine washable to ensure easy cleaning and maintenance. Buckwheat hulls are an ideal alternative for individuals with a foam allergy. The case may shrink just after a single wash. Opening the case can be challenging because the opening is a little small. It can be quite noisy when you move your head as you sleep. This japanese pillow will not be suitable for people that prefer something soft or less firm. Some individuals complain about the hulls moving to one side as they sleep. Comfort is the greatest benefit that you get from this pillow, and it is also one of the reasons why most people will buy it. But there are several other advantages that you can expect from using it, and they include the following. It is important for the spine to align with the neck and head for you to sleep well. This straight posture is necessary to ensure that you get the best sleep. Traditional pillows are soft which means that they will not give you proper support because the weight of your head causes them to collapse. However, buckwheat hulls move according to the shape of your head and neck to ensure that you get the proper posture and support throughout the night. If you are finding a pillow to support your neck and spine completely, we recommend you check out our Best Latex Pillow﻿﻿ buying guide and reviews. Unlike traditional foam pillows, the ones with these hulls are very breathable. The shape of the shells allows air movement in the headrest which will ensure that it remains cools as you sleep and that it does not develop some bad odors. Also, it is possible to control the temperature by putting the hulls in the microwave or freezing them. The best of the regular pillows will in most instances only serve you for a maximum of about five years. A good quality buckwheat pillow, on the other hand, has a long lifespan because all you need to do is replace the hulls. In fact, the average life for these pillows is about a decade, but it is not uncommon to find people that will use theirs for more than 20 years. Whereas some individuals prefer to put their head on very firm pillows, others find less firmness the best. But, you can have your pillow just how you want it if you go for the buckwheat because it makes adjustability possible. All one requires to do is increase the hull quantity for a firm pillow or reduce them to make it soft. The hulls that come with this pillow are not all the same, and so it is important to know the source as this is an indication of their quality. Always go for high-quality and organic ones which are dust-free and as clean as possible. Any hulls with debris and dust can lead to allergies, and so you should only go for a source that you can be sure removes the foreign elements during the milling and cleaning processes. Comfort and support are the two main reasons why you will want to buy this pillow, and so you should make sure that whatever you go for provides them. Going for a pillow with a zipper is a good idea as it makes it possible to customize the feel by removing adding more hulls. Also, make sure that what you choose is easy to contour and mold so that it can conform to a particular size, height or shape. Buckwheat pillows come with different price tags which in most cases depend on the source of the hulls and size. You can get one for as little as $20 while others come with prices that are in the hundreds of dollars. The expensive ones are in most cases the best, but you can still find something that is high-quality and still affordable. However, it is vital to make sure that the hulls are 100% organic, without any harmful elements and with an organic cotton fabric cover for this to be the case. Whether you have been using this pillow type for many years or not, you cannot always tell if a specific brand will be good enough before trying it out. Since it is not always possible to use the pillow before buying it the next best alternative is reading a buckwheat pillow review from a person that is already using it. Taking time to read reviews will let you know about other people's experiences with the head support before you buy it. You should never immerse or soak your pillow in water with hulls inside because they will not dry completely. In case you find your pillow with a musty smell put it out in the sun for a few hours. Always have covers on the pillows as this prevents staining of the linings. Damp hulls will not always need replacement because you can rejuvenate by drying them thoroughly in the sun. Always wash the cotton pillow case in cold water and allow it to air dry to avoid shrinkage. It is important to replace the hulls when they appear crushed and dusty and also if they do not look very malleable.